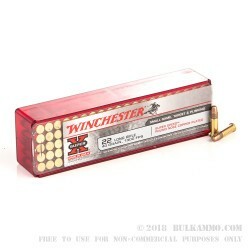 Winchester's Super X line is popular for its unparalleled standards of quality. Perfectionism at its peak, every Super X cartridge may as well have been hand-inspected for quality. 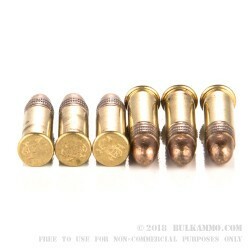 These 40 grain CPRN .22 LR cartridges are no exception, built to fire accurately and as reliably as possible. They're perfect for hunting varmints or practicing at the range, and their high quality means you won't have to worry about misfires or jams while you're on the hunt. Their copper-plated jackets even mean you can even use them at most public ranges, as they comply with the majority of lead exposure related laws! 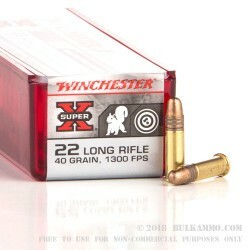 These Winchester Super-X .22 LR cartridges come loaded with 40 grain CPRN bullets. These high-velocity performance rounds produce 150 foot pounds of muzzle energy to fire its bullet at 1,300 feet per second. It's rimfire primed casing isn't readily reloadable. 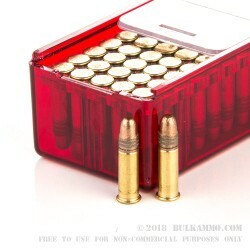 The ammo comes packaged in a plastic tub with a sliding cover, which contains 50 rounds stored nose-down in a plastic standoff. Excellent value, I will be back. Gun and ammo store 2 miles away from me and I would have got half the ammo for the same price!!! Excellent service and excellent ammo. Q: What is the velocity (fps) ? A: Hello Clifford, Winchester lists the muzzle velocity for their CPRN High Velocity .22 LR ammunition at 1300 fps. Q: What is the velocity (fps) of this ammo. A: Hello Rick Winchester lists the muzzle velocity of this ammunition at 1300 fps.